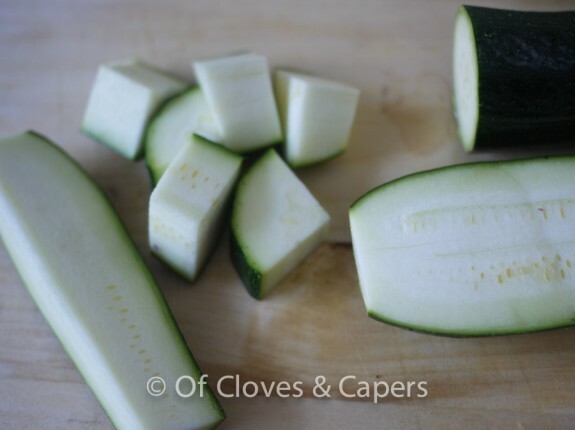 If courgettes are growing like mad in your garden like mine, and you’re done making the usual courgette cakes and what nots.. try this quick recipe. Not only is it a good way to add a chunk of vegetables to your prawn curry, but it is easily made on rush nights. This is my Mum-in-law’s recipe! Get those green green courgettes from your garden. They are oh, so delicious. This is a 27 cm beauty that grew in my garden! Dice them into uniform pieces. 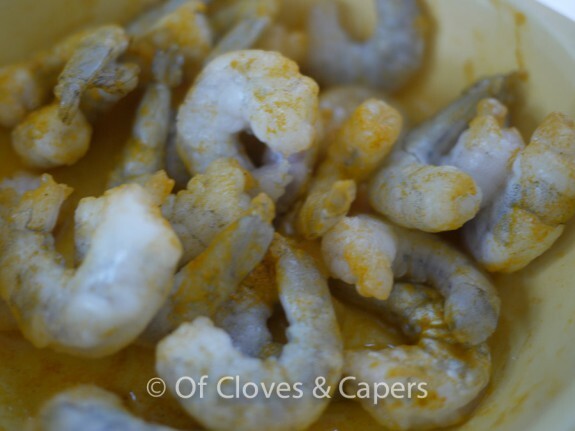 Apply 1/4 tsp turmeric and salt to taste to the prawns. Leave aside for 10 minutes to flavour the prawns. In a wok, heat oil. 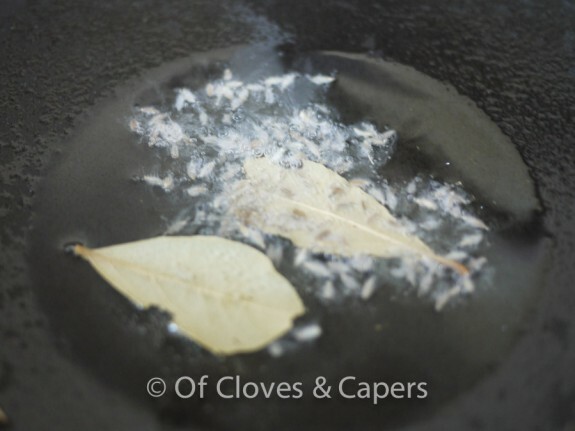 Add in the jeera and bayleaves. Add in the prawns, fry for one minute. Add courgettes, potatoes. Fry for a couple more minutes. Add in the salt, turmeric powder, chilli powder and other spices one after the other. Then, add in half a cup of water, cover and let cook for about 8-10 minutes, until all the flavours mingle and the courgettes cook. Tastes brilliant with rice and rotis. 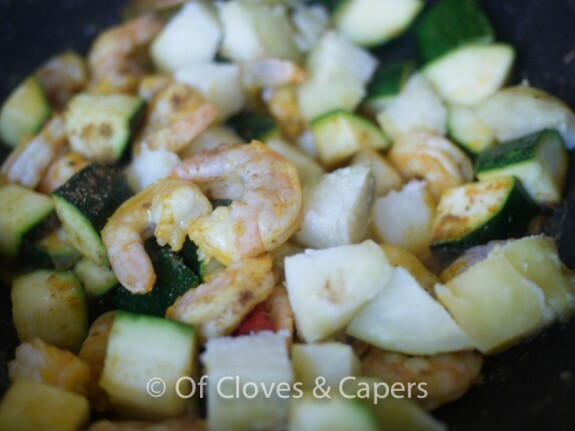 Recipe Type: Fish Ingredients: Courgette, Prawns If you like this recipe, please share, or leave a comment below. It only takes a click! 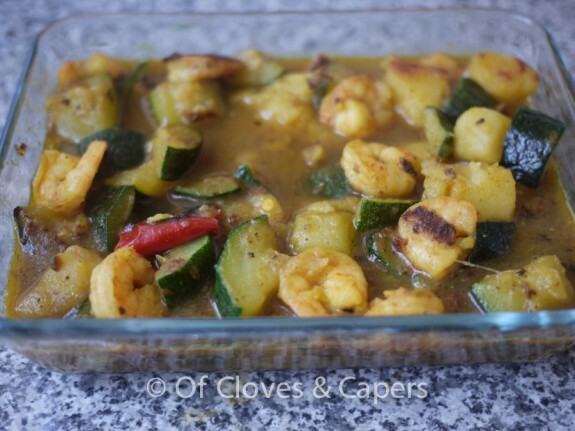 Won’t the prawns become too hard and rubbery while the potatoes and Zucchini cook ? They don’t. I had really large prawns, they do take a few minutes to cook. Courgettes cook in as much time. Also the potatoes that I used were boiled, so they just need to absorb flavours.